Massospondylus was a herbivore (plant-eater) that lived in Southern Africa and North America, about 208 to 204 million years ago, during the early Jurassic period. Massospondylus was around 13 feet (4 meters) long, and its name, chosen by Sir Richard Owen (who also coined the term of "dinosaur") means "massive vertebra" or "elongated vertebra" (referring to the large bones in the creature's neck). Massospondylus had a tiny head on the end of a very long and flexible neck. Its hands had five fingers, and could be used for both walking and grasping, and its thumbs were each equipped with a large claw. Polished stones ("gastroliths") have been found inside Massospondylus skeletons. Just like many birds do, Massospondylus is believed to have swallowed stones to help it grind up tough food. When the stones were worn smooth and of no further use, Massospondylus would have regurgitated the stones, and swallowed new rough rocks to replace them. Six Massospondylus eggs were found in South Africa in the 1970s. When the eggs were finally opened and the fossilized extracted after a 30 year wait, the eggs were found to contain near-hatchlings with no teeth. The lack of teeth has led some scientists to conclude that some degree of after-birth care may have been necessary, because the hatchlings would probably have been unable to feed themselves. African Dinosaurs - Massospondylus lived in North America and Southern Africa. North American Dinosaurs - Massospondylus lived in North America and Southern Africa. Massospondylus was a genus of dinosaur. "Massospondylus" means "longer vertebra". This name was chosen by Sir Richard Owen in 1854. Massospondylus was a member of the Saurischia ("lizard-hipped") order of dinosaurs. What this means, is that although Massospondylus was not closely related to lizards, it did have similarly shaped pelvic bones. Massospondylus was a Prosauropod - a member of a group of related early herbivorous (plant-eating) dinosaurs which had long necks, small heads, shorter forelimbs than hind limbs, and a thumb claw. 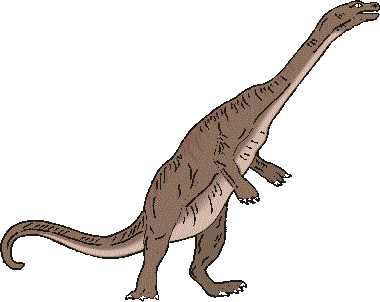 Massospondylus lived between about 208 million years ago and 204 million years ago, during the late Jurassic period. Massospondylus lived in North America and Southern Africa. Massospondylus was a herbivore (plant-eater). Massospondylus is thought to have swallowed stones which would have been used to help grind up tough plant material (some modern birds do the same thing). Fossils of these stones ("gastroliths") have been found in the same rocks as Massospondylus. Massospondylus was about 13 feet (4 meters) long. Massospondylus weighed about 1.5 tons.